Discussing the topic 'Maintaining the human element in an increasingly digital workplace', HR heads of India's top companies said that this change is necessary for hiring youngsters, but the new workplaces are not devoid of human touch. Though the advent of a digital world, and hence digital workplaces, is inevitable, the change won't really phase out humans but give them better opportunities for innovation. This was the sentiment which all expert HR panelists shared at the Business Today's Best Companies to Work For event on Wednesday. "Fundamental point for any transformation are employees and the charge lies with the leadership and most employees are always ready to change," said TK Srirang, Head Human Resources, ICICI Bank. 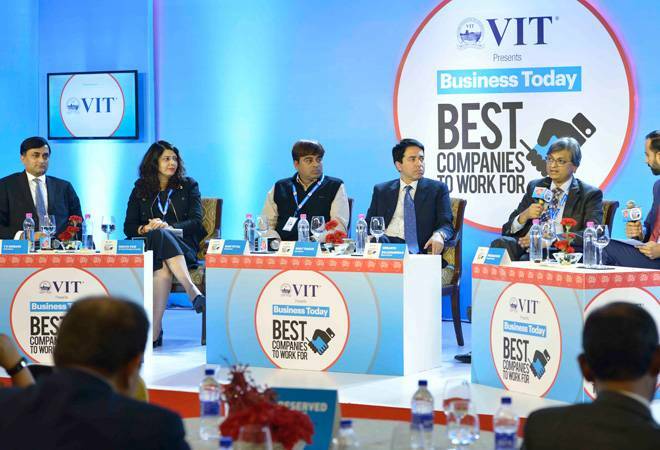 Other panelists participating in the discussion were Srikanth Balachandran, Global CHRO, Bharti Airtel; Rohit Thakur Managing Director and lead, HR, Accenture India; Babu Vittal, head, human resources, Shopclues; and Shilpa Vaid, Chief Human Resources Officer, Arvind Lifestyle Brands. Prakash Rao, Vice-President and Head, Human Capital Managemnt, PeopleSteong moderated the panel. Discussing the challenges start-ups face when it comes to workforce, Vittal said that employee retention is a big problem for them. "We are worried about when an employee leaves and not about why he leaves and accumulate data around it and try to solve the problem," he added. Vaid stressed on the gender diversity at workplace and specified that making a workplace impartial doesn't mean just offering work-life balance to women employees but equality on all levels. "Women employees want you to value them, pay them and promote them as their male counterparts and that is going to win their loyalty," she said. Other panelists stressed on maintaining the open culture in the organisation, investing in employees and making organistions more adaptable for the younger generation.